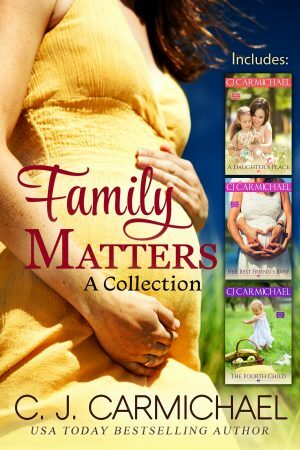 A collection of three novels about women and their children, and the men who love them. What’s a single mother do when she’s run out of options? After her father kicked her off the family farm because she was pregnant, seventeen-year-old Libby Bateson swore she’d never go back. She and her daughter, Nicole, have scraped by in the city for the past eight years, but when Libby discovers Nicole is being bullied and underperforming at school, it’s time to swallow her pride. Going home isn’t easy. Libby finds the farmhouse neglected and filthy. Her father is a cantankerous hermit who won’t speak to her. Even Gibson Browning, the farmer next door whom she’d once had a crush on, is making her life complicated. Gibson’s wife died two years ago and now he’s a single parent, too—raising a daughter the same age as Nicole. The hard working, good looking Gibson is a loyal friend and a loving father. Libby knows she could easily fall for him—which would be a mistake. Because Libby can’t stay in Chatsworth for long. Not without risking exposure of the secret that could ruin her daughter’s life. From the outside Claire Ridgeway looks like she has it all—a handsome, successful husband, three young, healthy daughters, a beautiful home in Toronto and a cottage in Lake Country. But Claire knows there are fissures in her marriage that could threaten everything. Even so, she’s shocked when Kirk announces he’s in love with another woman. Turns out his late nights at work have been spent wining and dining this other woman. Shattered by Kirk’s revelation, Claire is sure her marriage is over and when Kirk suggests counselling she wonders if there’s any point. But with so much at stake, shouldn’t she at least try? Not just for her and Kirk’s sake, but for their daughters…and the fourth child Kirk doesn’t even know she’s expecting.